She is know for her girly bow in between her cute mouse ears. You can change up the color and make your Minnie all red since she wears red sometimes but I wanted her to stand out from the Mickey cupcake. If you are making this cupcakes the night before the party make sure you don’t store them in the fridge with the fondant pieces on because they will start to melt. You can always bring the cupcakes back to room temperature for an hour than place the fondant decorations on. 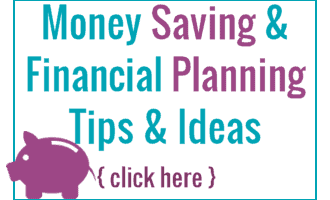 Click on any of these links to learn how to make How to make Icing as good as a bakery , How to make a cupcake swirl and How to make a boxed cake mix taste like a bakery . Color your buttercream frost pink. Place your star into your pastry bag and fill it up with your pink frosting. Pipe a swirl of frosting onto each of your cupcakes. 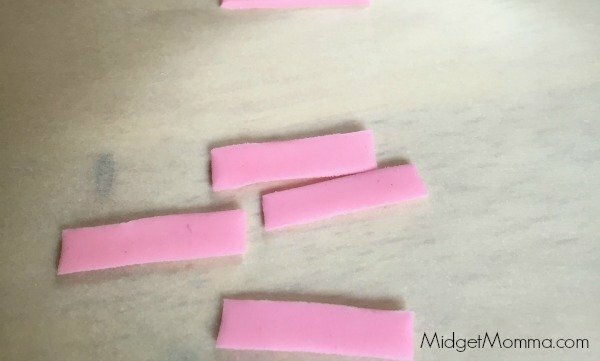 Dye some of your fondant black and some of it pink. Spread out a small amount of powder sugar onto your work surface. Roll your black fondant out to 1/8 of an inch thick. Using your 1/3 inch circle cutter, cut out 48 circles in the fondant. Place the circles onto a plate lined with parchment paper. Set those aside until they are hard. Spread out a small amount of powder sugar onto your work surface. 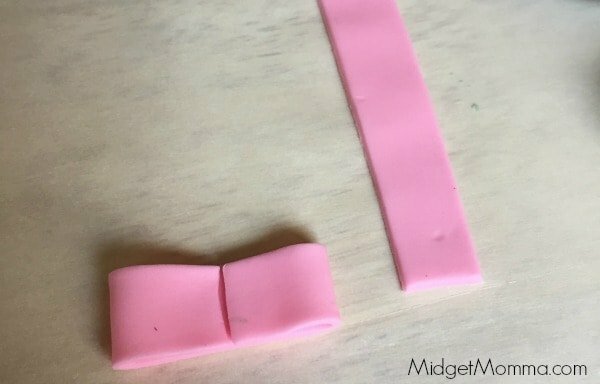 Roll your pink fondant out to 1/8 of an inch thick. Cut it into ¾ inch wide strips. Cut out 24 pieces that are ¾inch by ¼ inch rectangles. Than cut out 24, ¾ inch by 3 inch rectangles. Lightly wet the center of the 3 inch piece with a small amount of water and bring both ends to the center. Wrap the small rectangle around the center of the bow and keep it in place with a small amount of water. 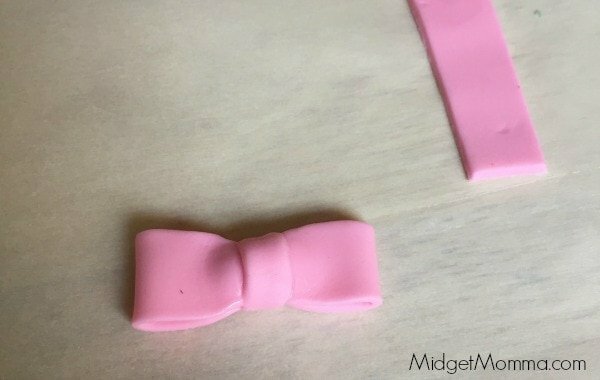 Gently squeeze the middle of the bow to give it some shape. Repeat this with all the bows. Stick two ears into the top of the frosting making sure to leave a small gap in between the ears, Repeat with each cupcake. Press one bow in front of the ears gently into the frosting. Repeat with each cupcake. 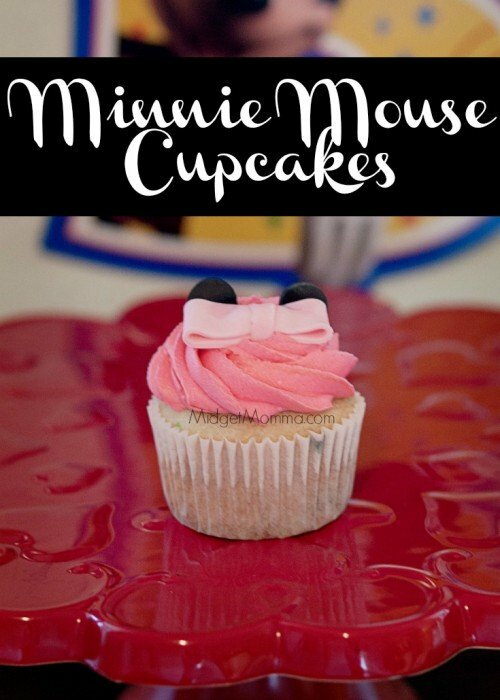 Looking for more Disney cupcakes? Check these out!